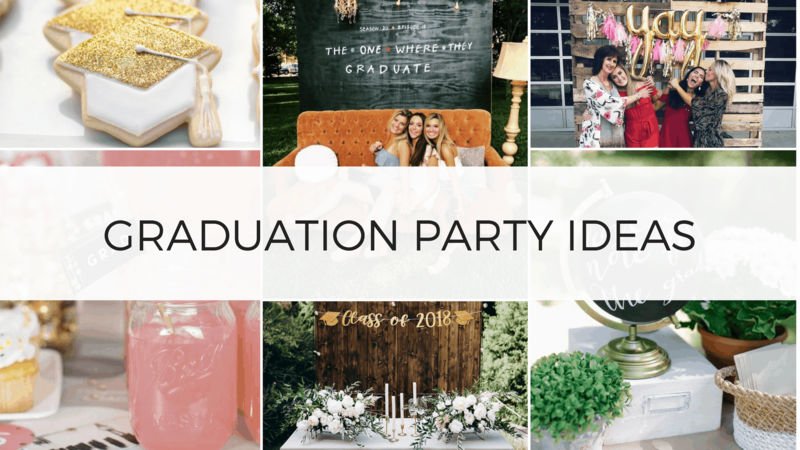 This post is all about graduation party ideas. The time has finally come to start thinking about graduation party ideas. 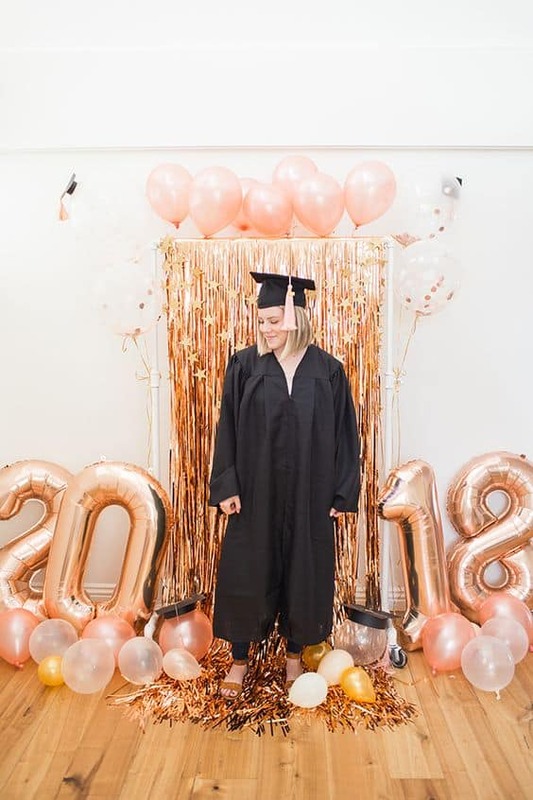 Whether you are a parent of a graduate or the grad yourself, coming up with graduation party ideas that will WOW your guests can be difficult to find. 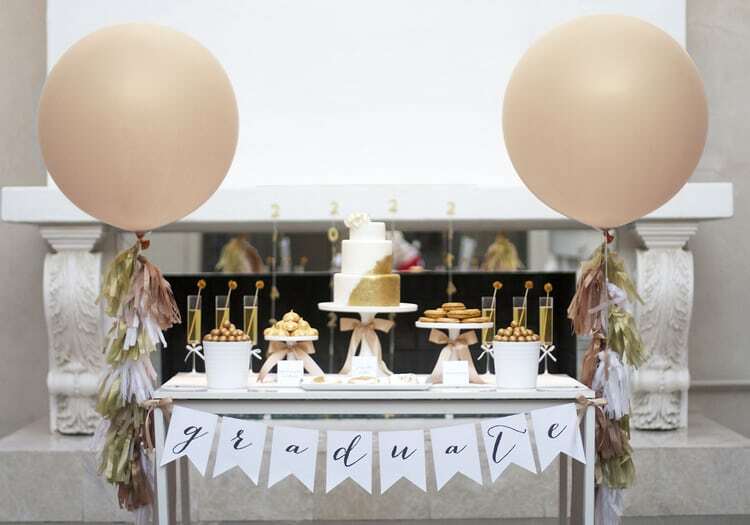 Throwing a graduation party can be stressful but these ideas will give you just the inspiration you need. 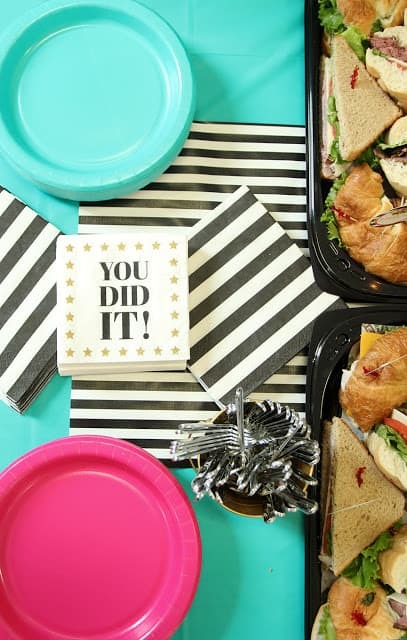 This post shows you the best graduation party ideas that are guaranteed to impress your guests. Picture from @Macy Lima Decor. Celebrate the graduates college by incorporating the colleges state into the decorations. 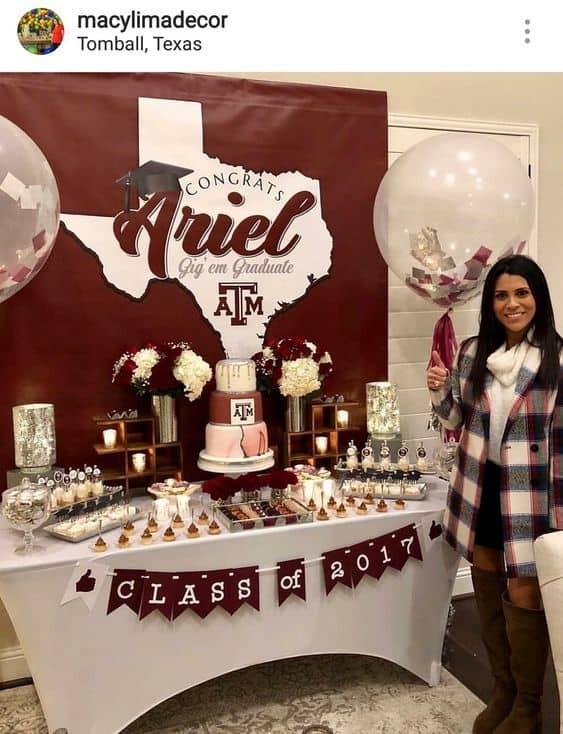 This graduation party used her colleges state as the backdrop to her candy bar. 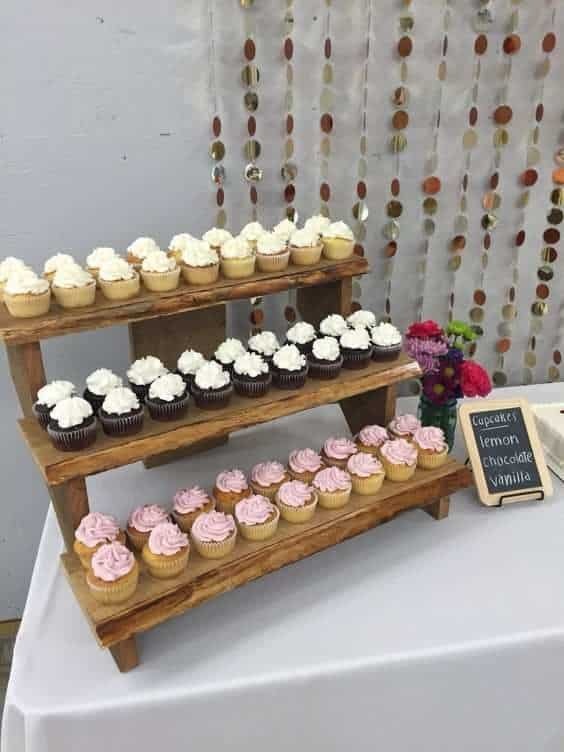 This is one of the simplest graduation party ideas and something that can be whipped up very inexpensively. 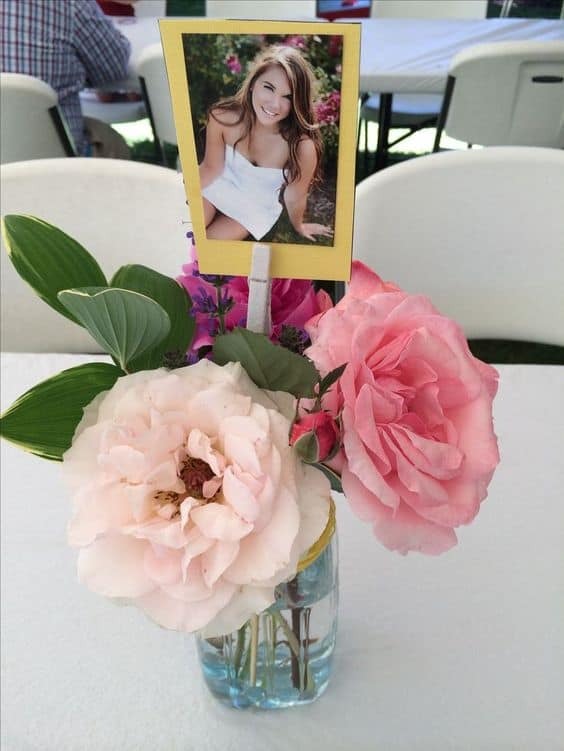 All you need is a few bouquets of flowers to take apart, a vase from the dollar store, and a picture of the grad! See more pictures from my grad party here: The Secret To Throwing A Graduation Party People Will Remember. This sign is from my own graduation party! My friend and I painted these and put them at the entrance of our neighborhood to show guests where they need to go. It was the perfect entrance to the party and helped set the theme. Is it really a graduation party without large number balloons?! 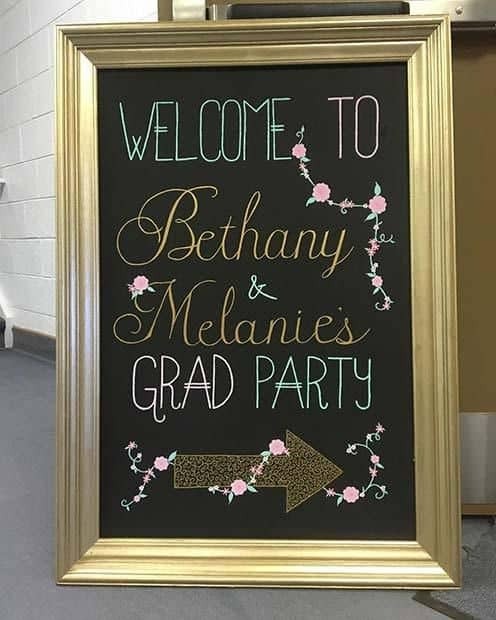 For real though, this is one of the most popular graduation party ideas because it makes a large impact at an extremely low cost. It's also a super fun thing for your guests to hold while they take pictures with the graduate. Aren't these straws so cute?! People will be so impressed to your attention to detail with these graduation straws. 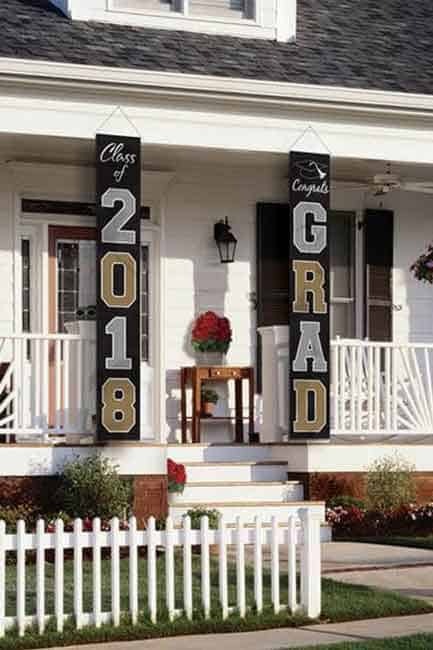 One of my favorite graduation party ideas - graduation banners! 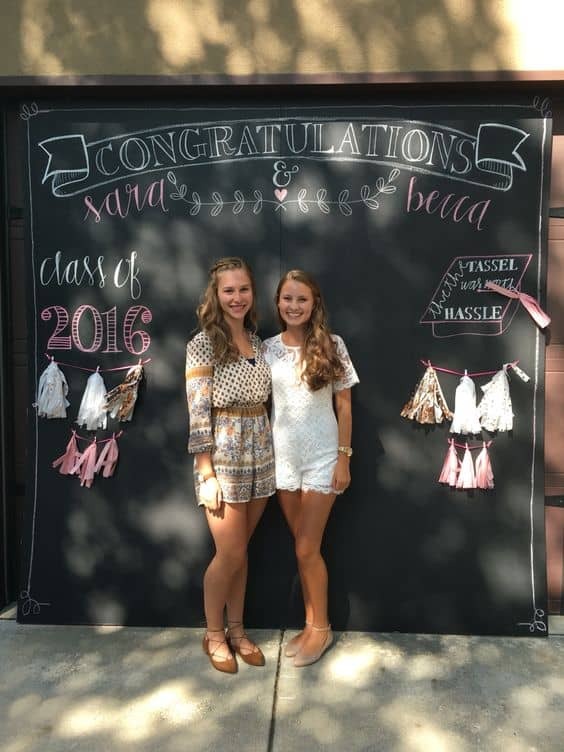 I had banners all over my grad party because they are so cute and are cheap (win-win!). Nowadays, you can find all different kinds of graduation themed banners on Amazon. 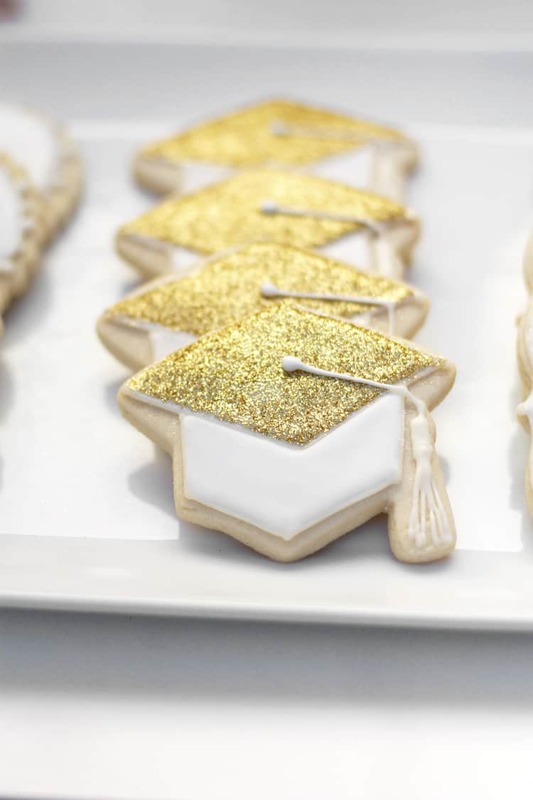 These graduation themed cookies are the perfect addition to the dessert table. 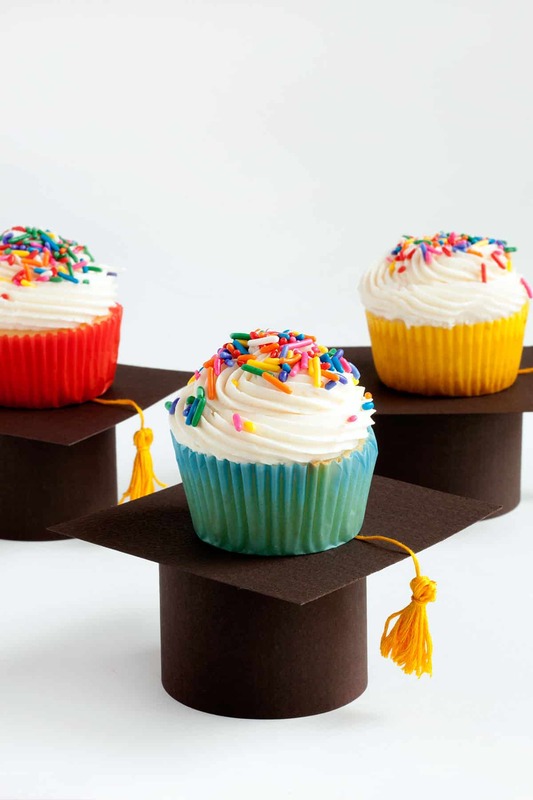 These graduation cap cupcake stands are really easy to make and make a huge impact. 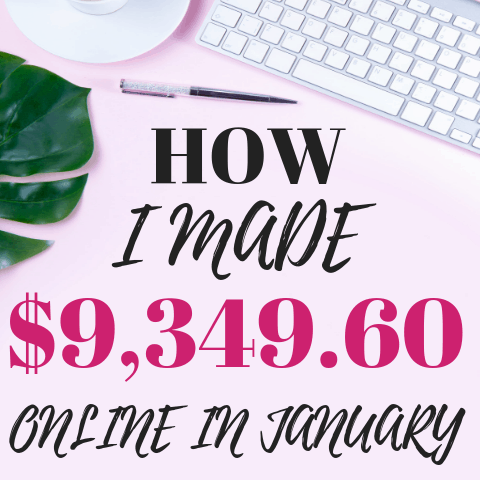 Click here to see the tutorial for this DIY. Put together a memory board of all the major events that happened in high school. This is such a fun thing for the guests and other high school graduates to look at and reminisce on all that has happened in the last four years. 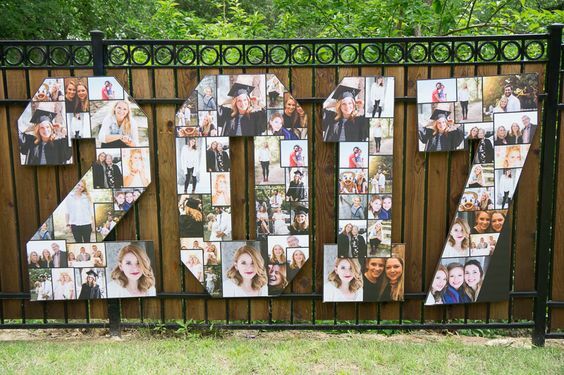 If you're looking for inspiration for a graduation photo booth background, then this is it! Chalkboard inspired backdrops are very popular and really are not hard to put-together. 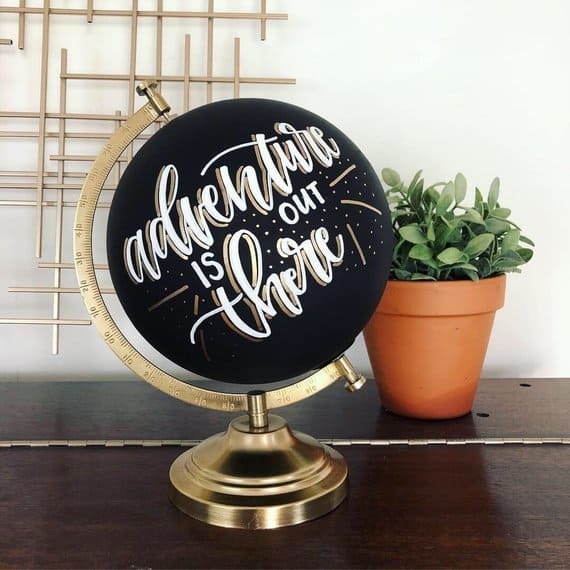 All you need is two large sheets of MDF (you can find this at Home Depot), some chalkboard paint, and chalk markers! 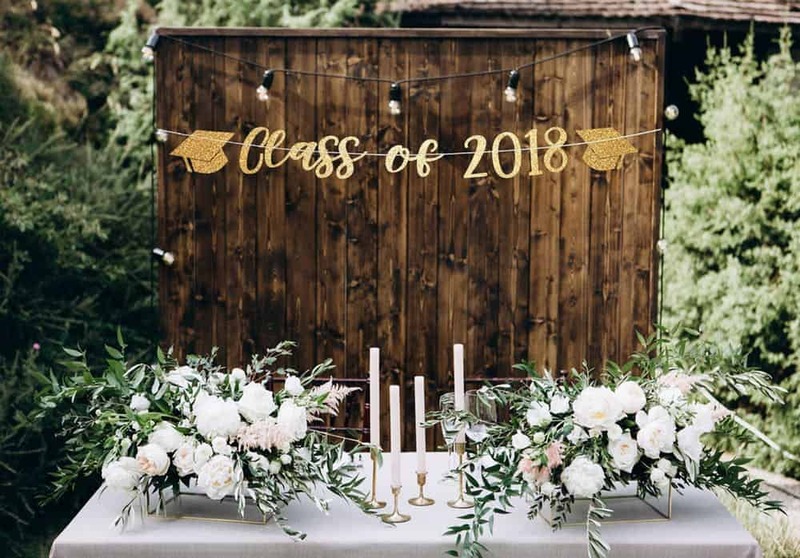 I love how in this picture they used a tassel garland to add some dimension to the board. Top a simple cake with a graduation themed topper for an easy way to make the cake look much fancier. Print off inspirational quotes that relate to graduation and frame them around the party. They add a big impact for a little price. You can download my free graduation prints here. 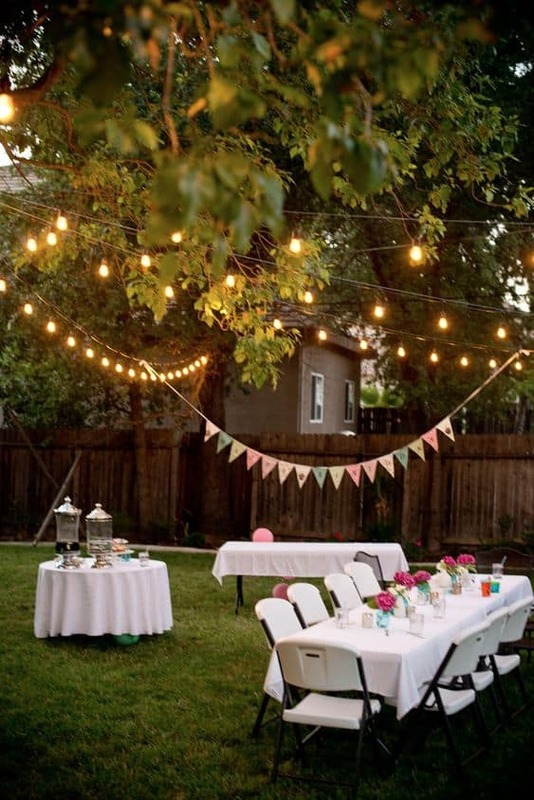 How cute is this outdoor graduation party ideas?! Adding the lights across the trees makes the party feel much more cozy. When I graduated college, I was looking for as much advice as I could get! 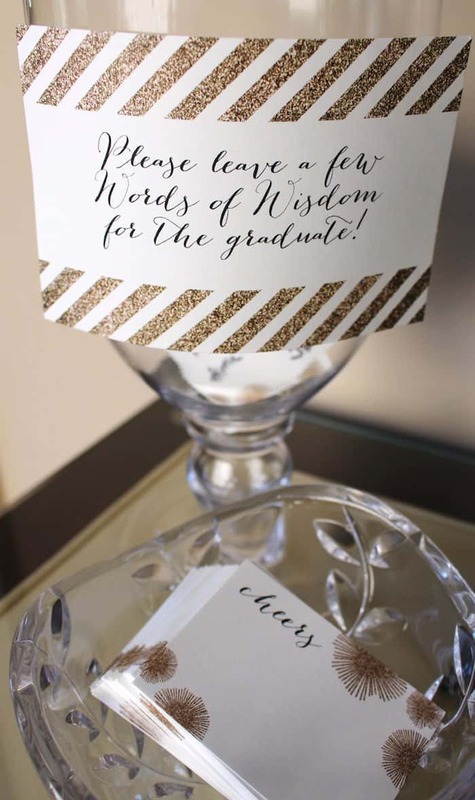 This is such a fun way for guests to get involved and give their top piece of advice to the graduate. Coming up with an Instagram hashtag is a great way to make sure that you are able to see all the pictures guests took while at your party! 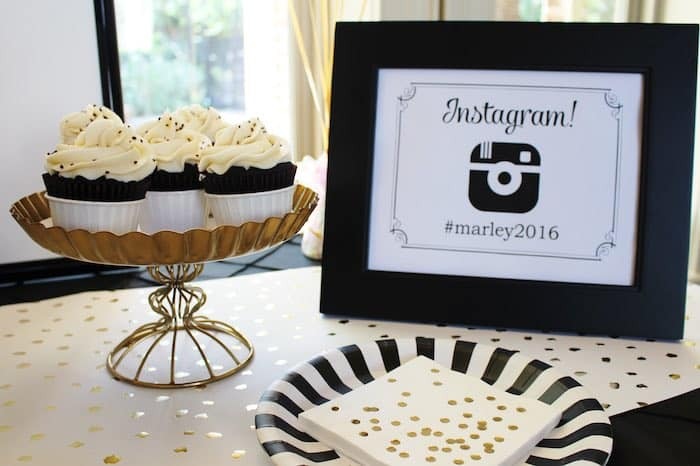 Make sure the guests know what the hashtag is by placing a cute print out in frames around the party. Who would have thought an old ladder would look this cute?! 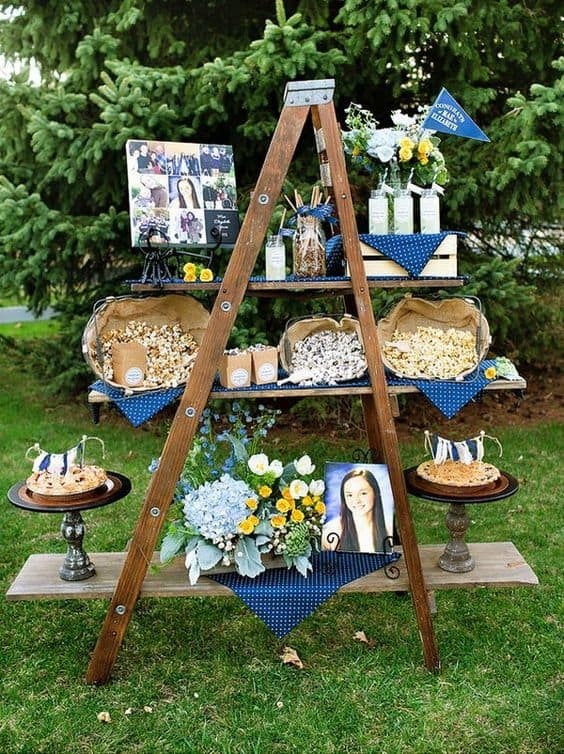 Placing pieces of wood between a ladder is a very creative way to display snacks and other graduation party mementos. This is one of the most classic graduation party ideas and for good reason. Not only will this show the guests the exact house the party is at but it also features all the cute photos of the graduate growing up! 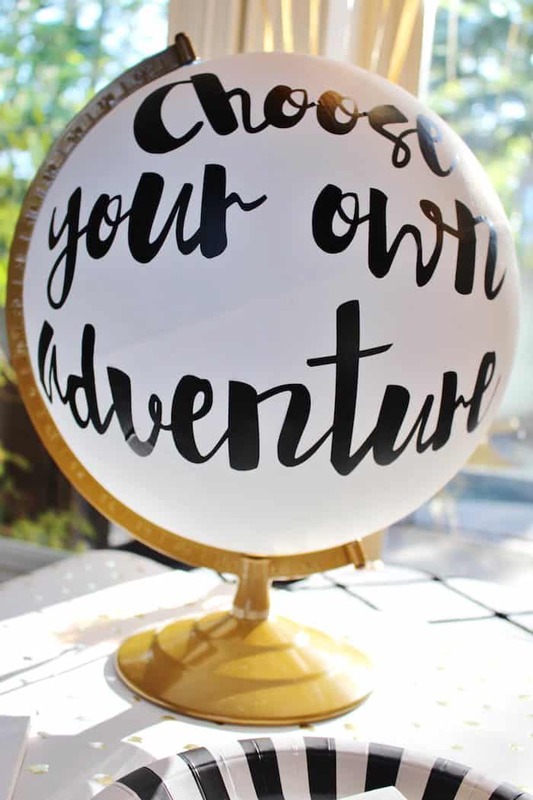 Head to the local thrift store and see if you can get your hands on an inexpensive globe. 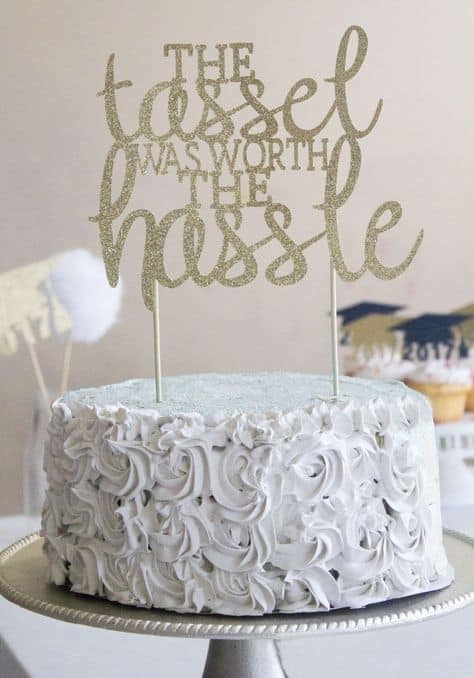 Paint the gold and add a cute saying on it and you've got the perfect graduation party ideas. If I was a huge Friends fan I would have 100% used this at my graduation party. 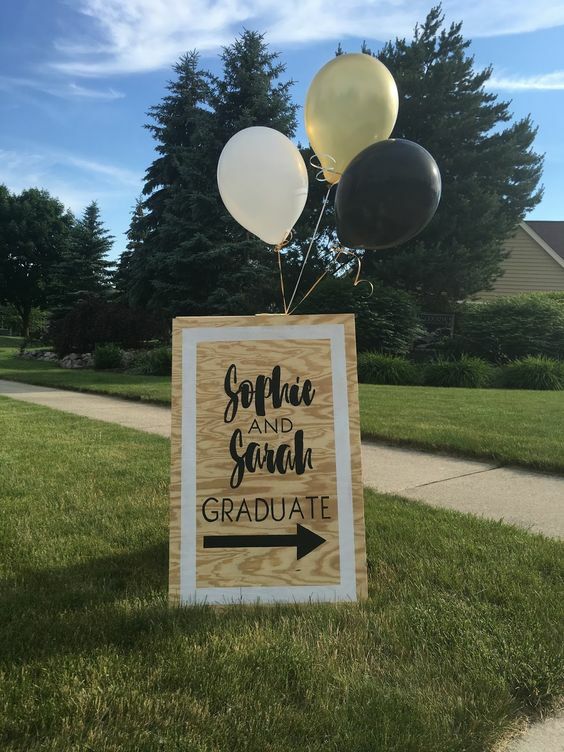 One of my all-time favorite graduation party ideas! 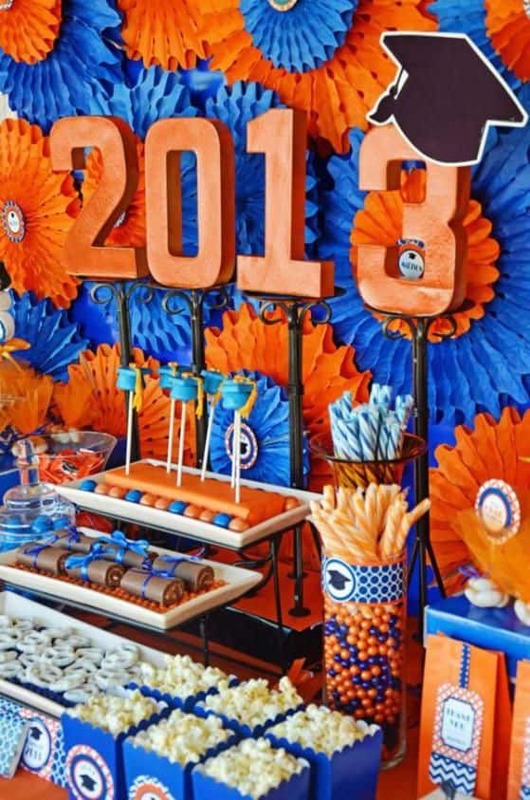 Isn't this graduation party idea beautiful....so obsessed. 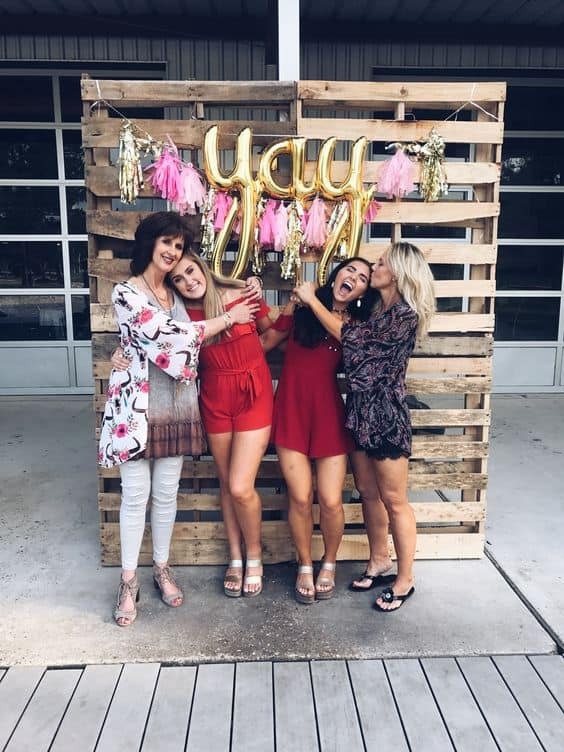 I love the classiness this graduate and her mom were able to bring to her party! 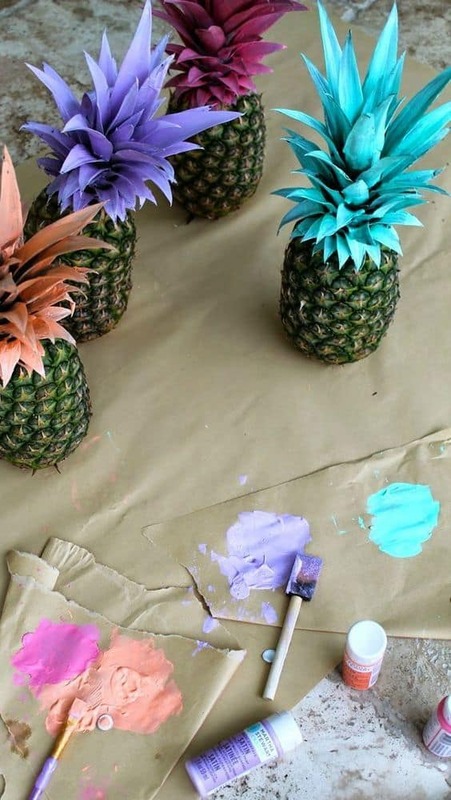 This pineapple DIY is an easy centerpiece idea! Stick in some pictures into the leaves of a pineapple and you've got the perfect graduation party centerpiece. I just think these are SO cute! You can find the tutorial for this cupcake toppers here. 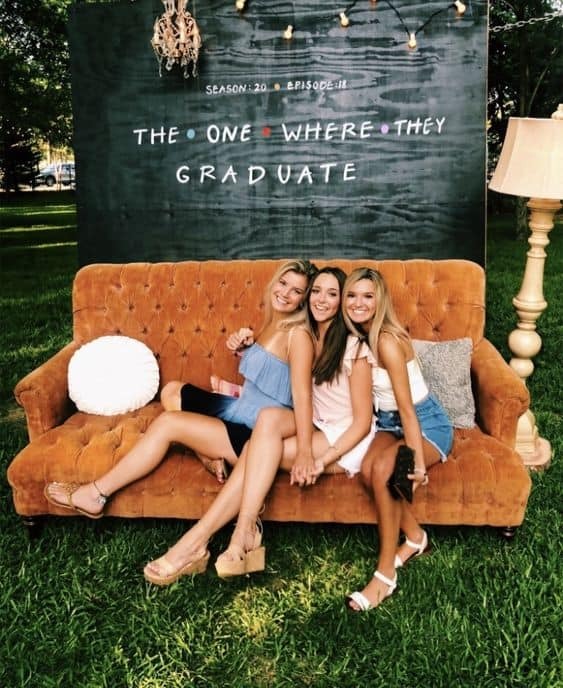 I used pallet boards at my graduation but totally wish I would have used a garland and "yay" balloons like these girls did. 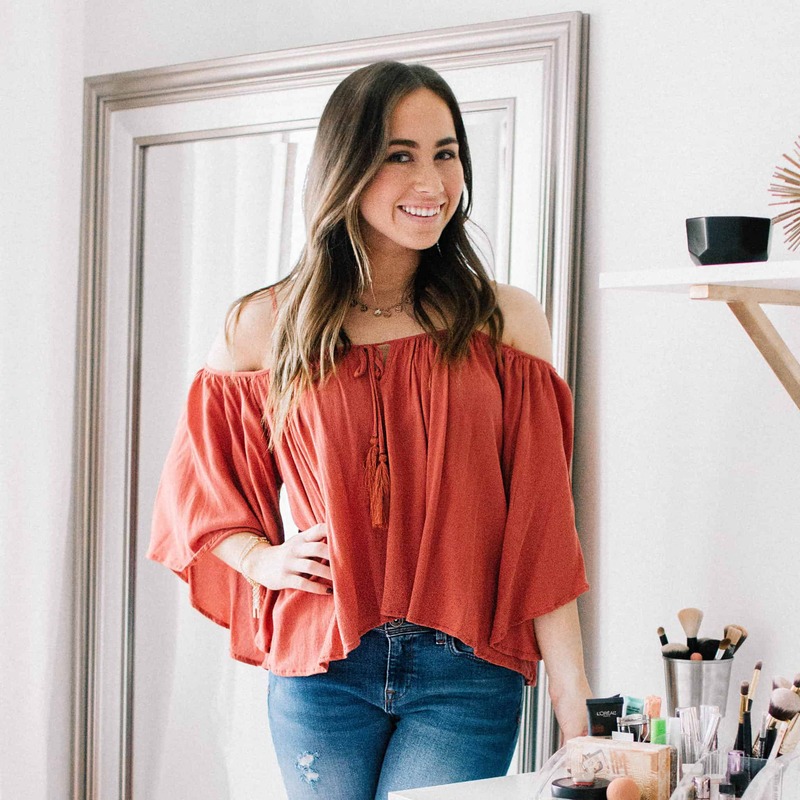 Such an easy backdrop but so cute and trendy at the same time. 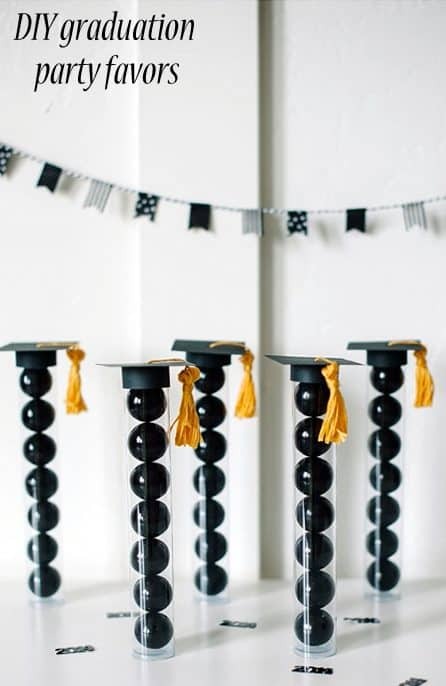 36" inch balloons are all the rage for graduation party ideas and can be found in pictures all over Pinterest. Best part? You can get 5 of these large balloons for less than $10 dollars. 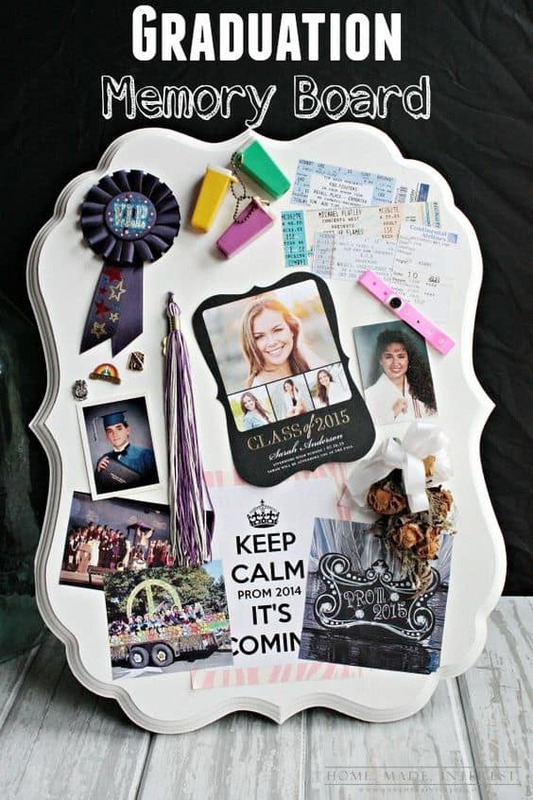 Display pictures of the graduates childhood on a large wood picture board. 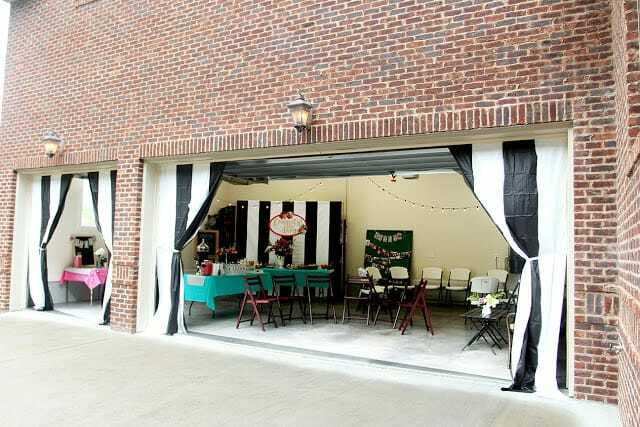 Can you believe those "curtains" on the garage doors are actually table cloths?! This tutorial is really impressive and something everyone who is planning on having their graduation party in their garage should read. These rose gold balloons and fringe ​would make for the perfect photo backdrop. Buy or DIY this cute rustic holder to display all your cupcakes. 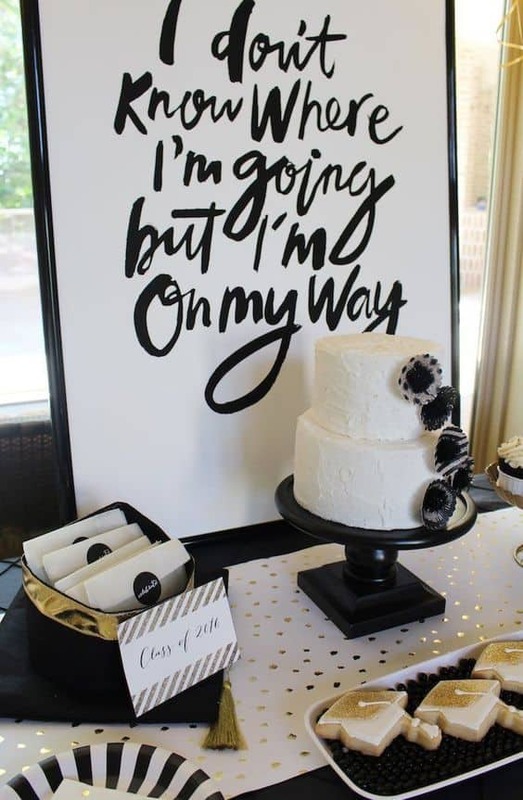 Paint a large frame center black and then add party details in cute font. 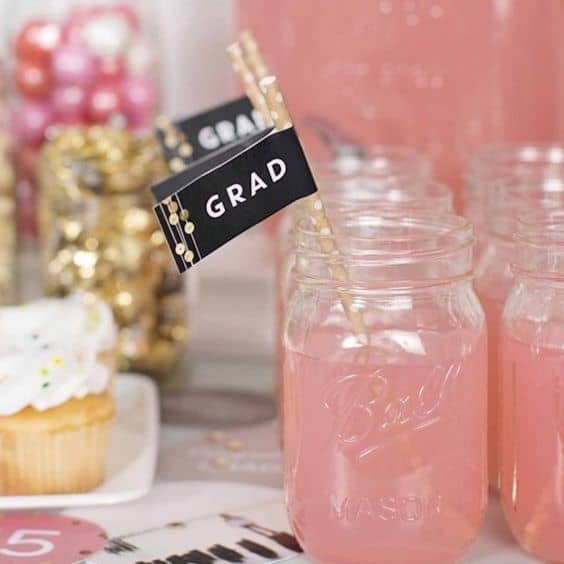 Is this not one of the cutest graduation party ideas?! Everyone loves tacos and this is such a perfect way to tie it into a graduation party. Easily decorate balloons by turning them into graduation caps. Such a cute and fun idea to enhance the normal balloon! Don't forget about the small details! Graduation themed napkins add a small but impactful touch to the party. Who doesn't love donuts?! 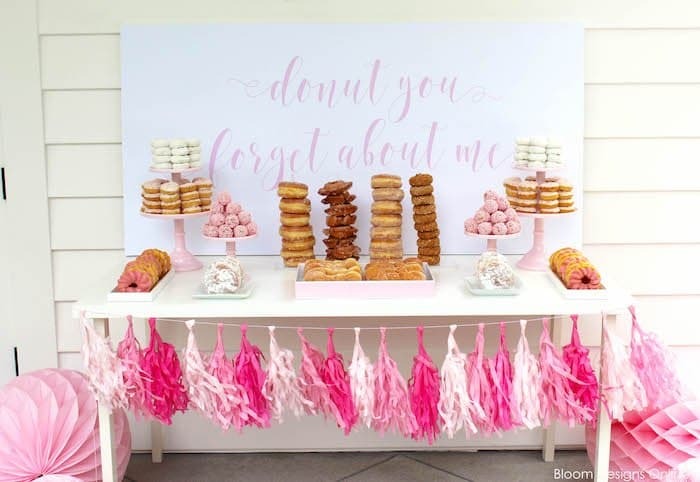 Set up a donut bar for your guests to grab from and anchor it with a graduation themed sign, "Donut Forget About Me". 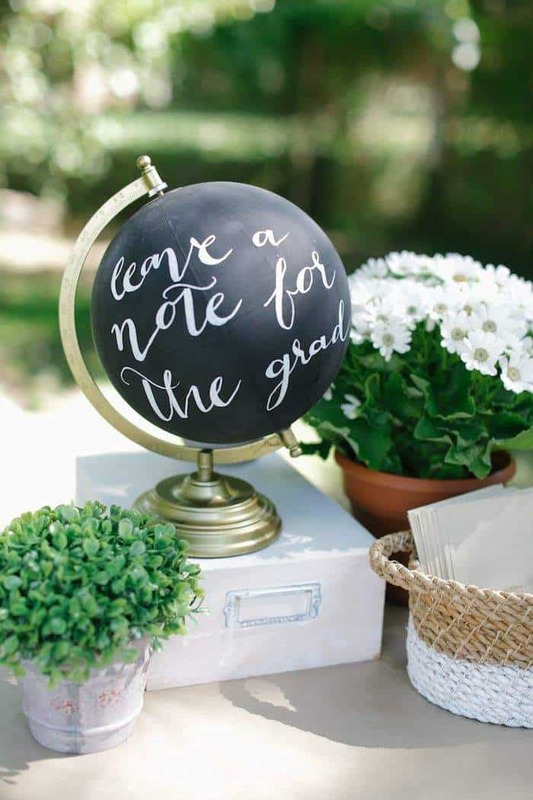 Use a globe to indicate to guests to leave a note for the graduate or paint a cute quote! 37. 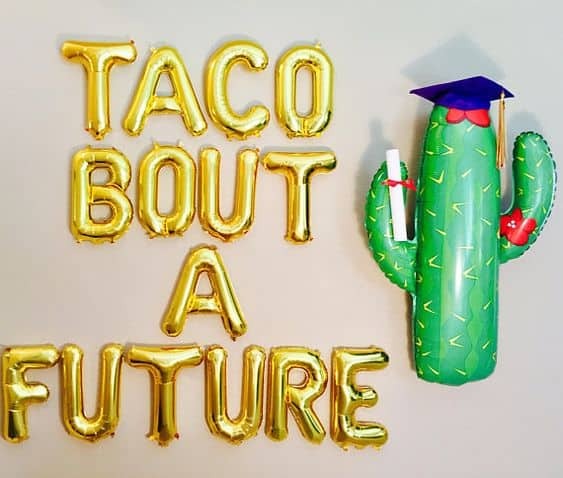 Have a "taco" themed graduation party. 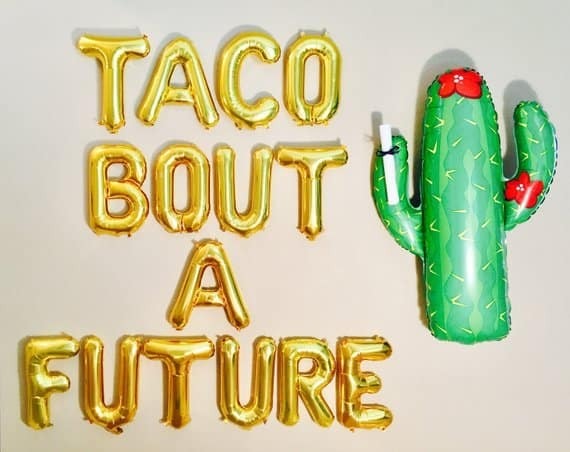 It can often to be hard to find graduation party ideas for guys but this taco themed party is such a great gender-neutral idea! 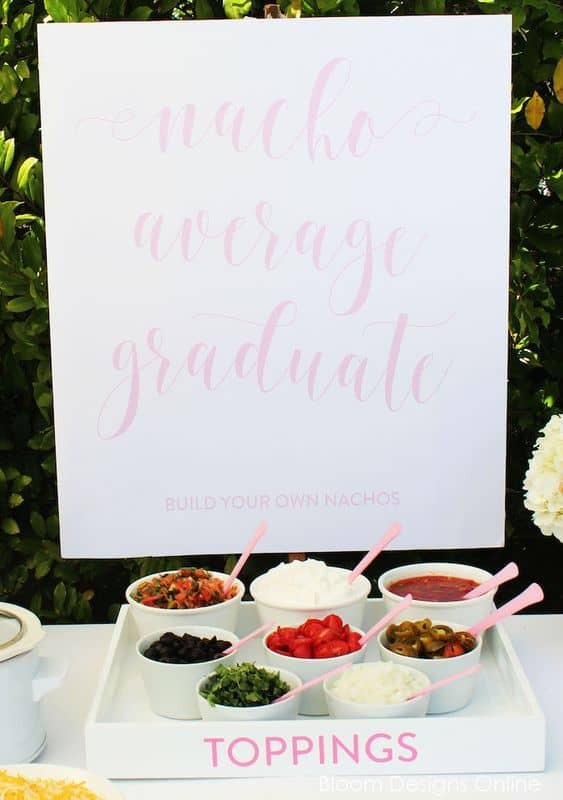 You could also take the idea from above and have a taco bar with a sign that says "Nacho Average Graduate". 38. 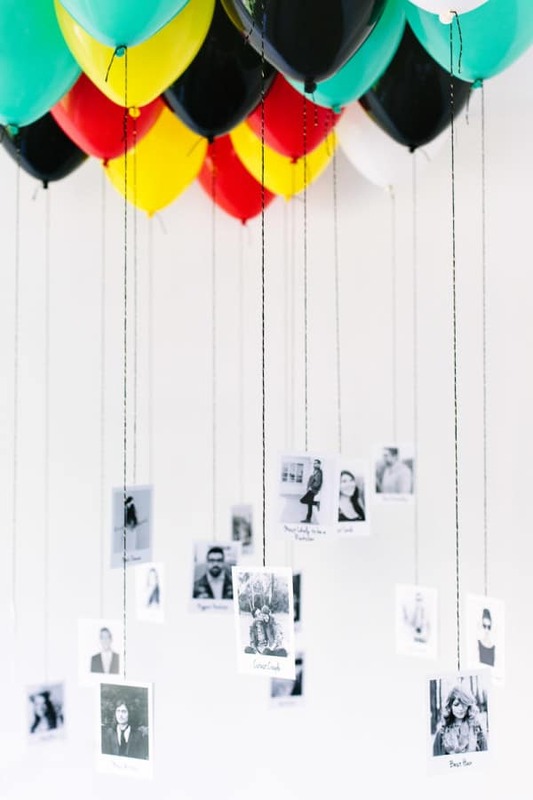 Use balloons to display pictures. 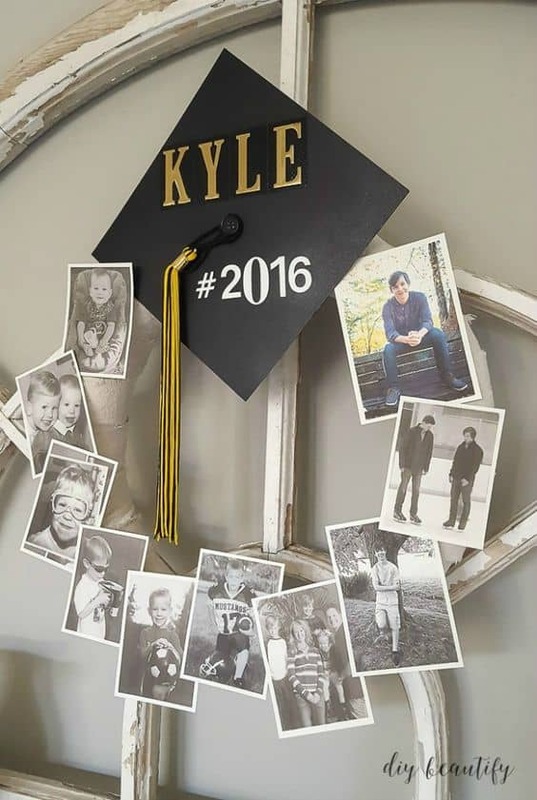 Use balloons filled with helium to hold up special pictures of the graduate. 39. 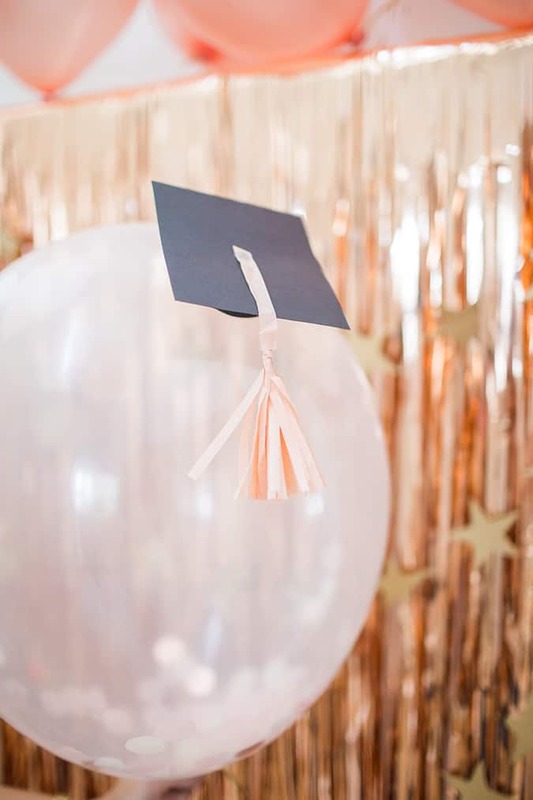 DIY these graduation cap party favors. Don't let your guests leave empty handed and follow the party theme with these graduate gumball favors. 40. Showcase sports memorabilia in a creative way. Trying to find a creative way to display sport memorabilia and/or trophies? 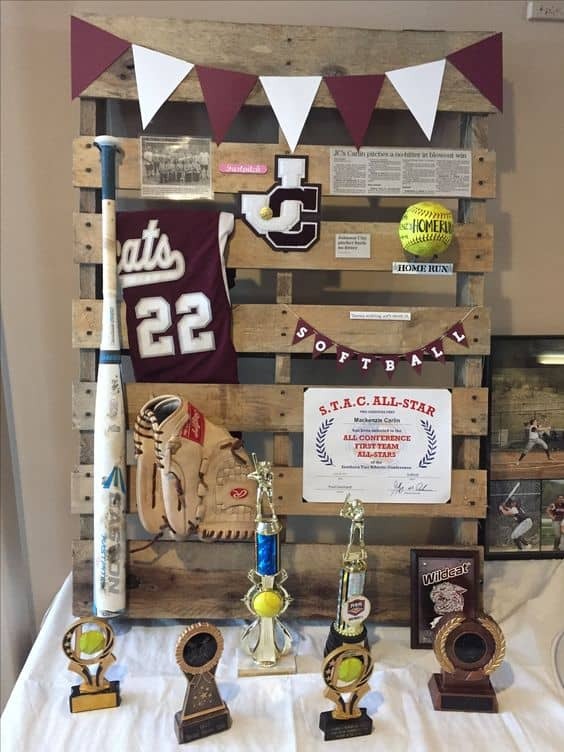 Use a pallet board and table to showcase all the sporting equipment. Use coffee beans in a cup to hold picture sticks. 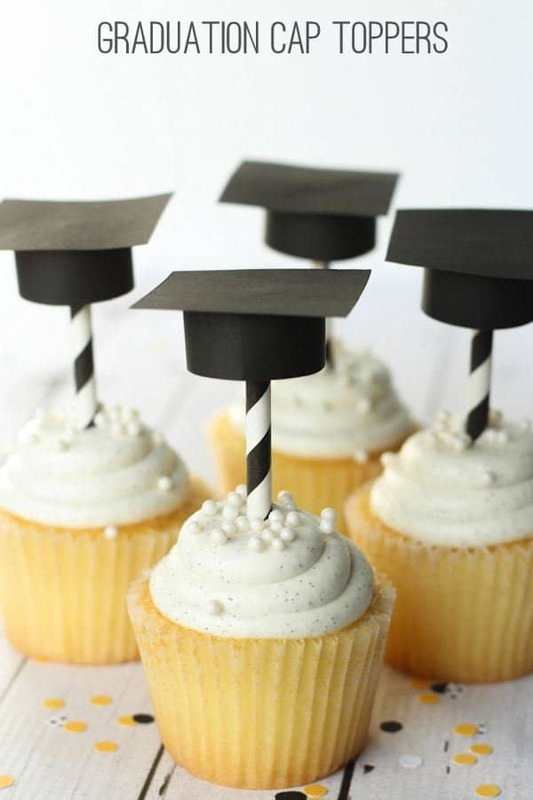 This is an extremely easy way to situate cupcakes in a way that goes with the graduation theme. 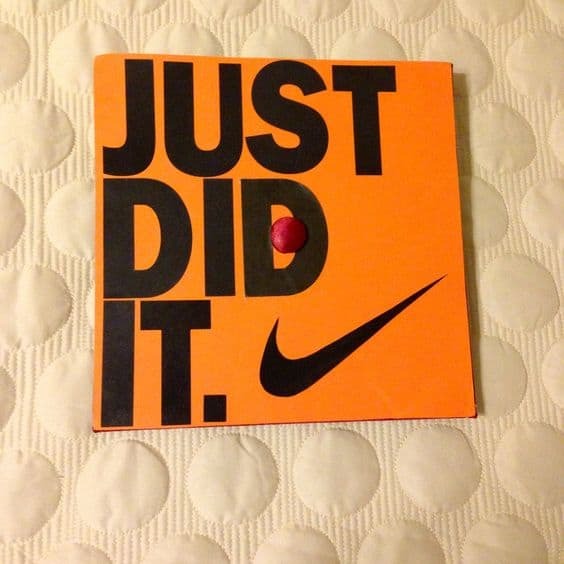 How fun would a Nike themed graduation party be?! 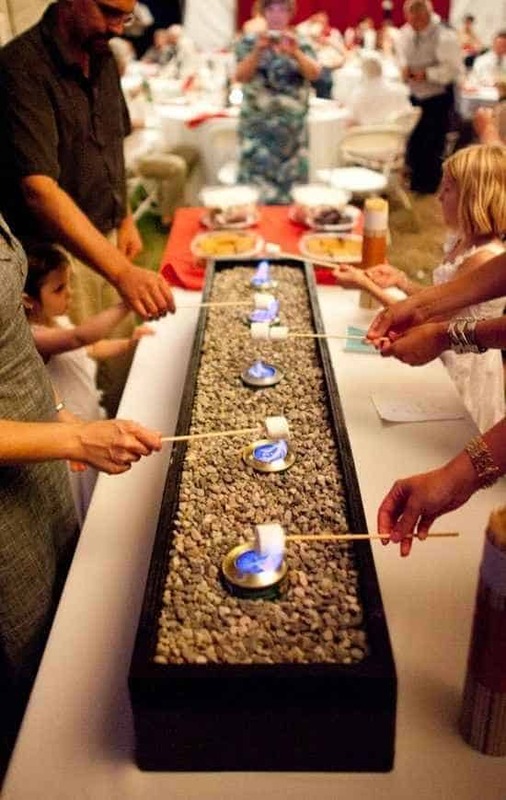 A s'mores bar is the perfect outdoor activity to have for your guests. I mean, who doesn't love some s'mores?! 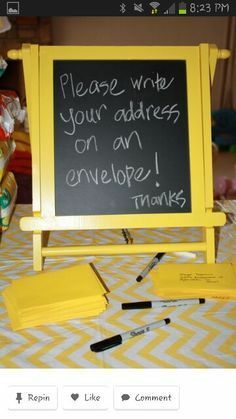 Plan ahead and have your guests write their address on a card. Not only does this save you time, but it will also ensure that all guest addresses are correct. Use a graduation card holder for your guests to put their cards and money into for the grad. This makes sure that the cards don't blow away and that there is a specific spot for them so they don't get lost. 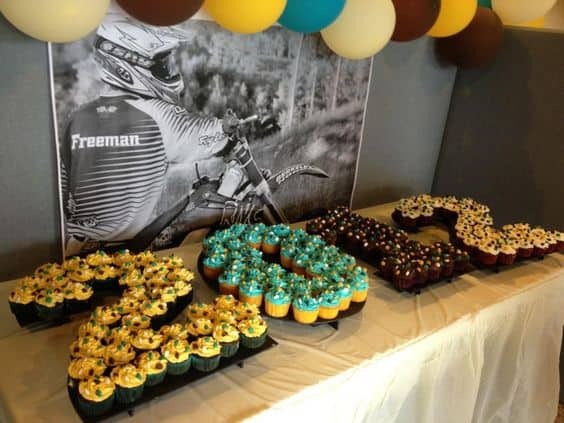 Here is another graduation party ideas featuring balloon numbers! This is really easy backdrop that you can set up for your guests to take photos in front of. Aren't these so fun?! 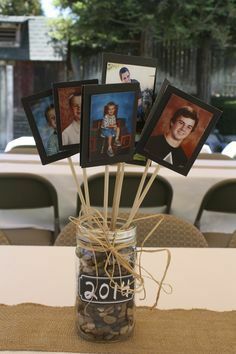 Use your own photos in a shape of your graduation year for this graduation party idea. Place your mache letters on top of candle stick holders so they can be easily seen throughout the party! 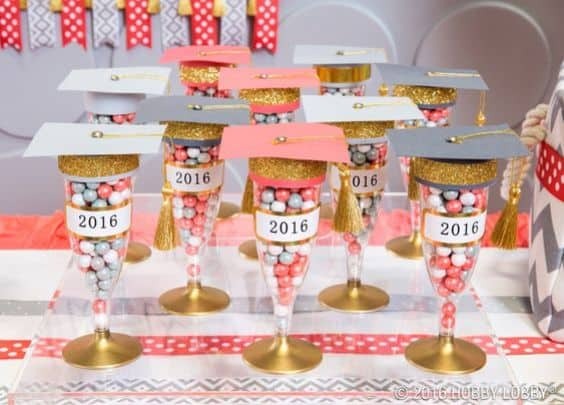 Fill champagne flutes with candy and turn them into graduation hats! 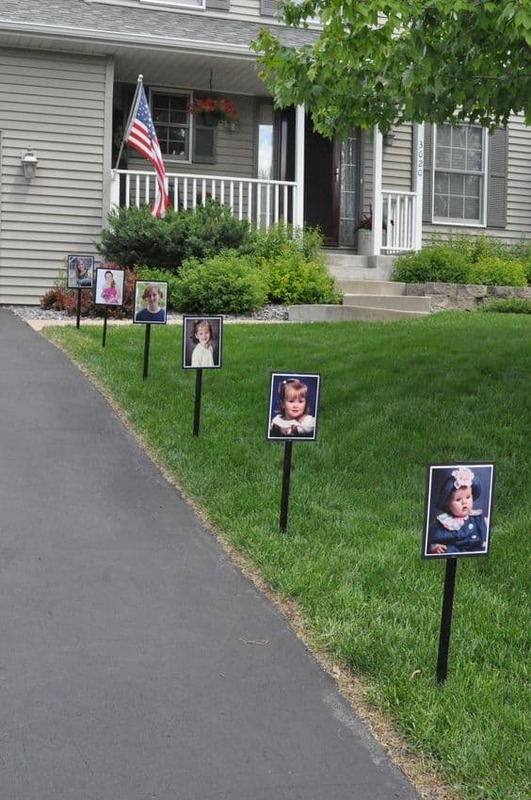 Hang up signs in front of your house to allow guests to know where the party is being thrown. Did you know that you could make this beautiful wreath out of a pool noodle?! You can find this graduation party tutorial here. 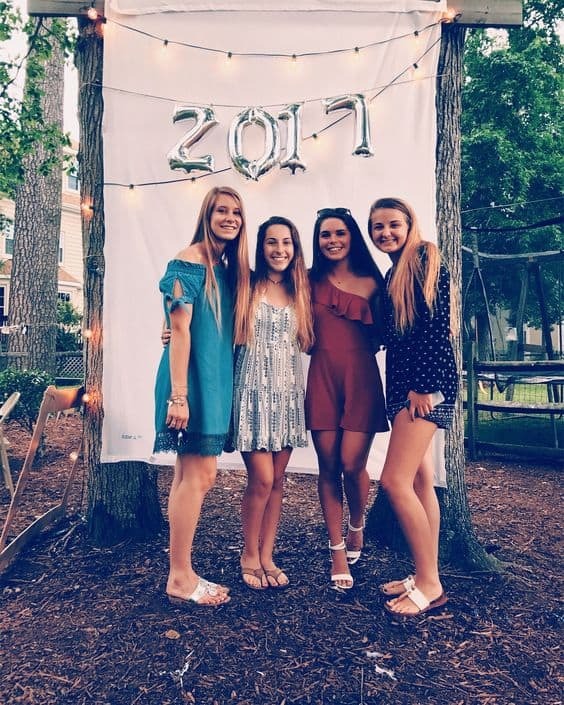 This post was all about the best graduation party ideas.